This is a wonderfully simple, but delicious meal. 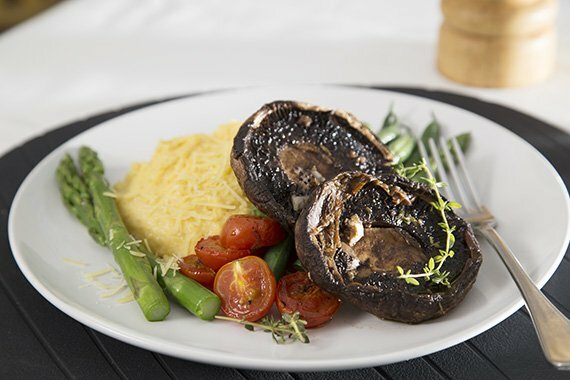 The creamy polenta teams beautifully with the roasted mushrooms and balsamic vinegar. Throw in some crunchy, blanched greens and you have yourself a great vegetarian dish. Enjoy! Preheat oven to 180°C. Wash the fresh produce. Trim the mushrooms stems, and place on an oven tray gill side up with halved tomatoes. Mince garlic, and in a small bowl mix with 1 TBS olive oil, balsamic vinegar and thyme leaves (you only need a large pinch, reserving remainder). Brush over mushrooms and tomatoes. Season with salt and pepper and some sprigs of thyme. Cook for 20 minutes (set a timer for half way), until mushrooms are tender. Put a medium sized pot of water on to boil. Trim the ends off both the beans, and the woody ends of the asparagus. Set aside greens for blanching in step 5. After the mushrooms have cooked for 10 minutes, bring chicken stock with ½ cup of water and milk to the boil. Once stock and milk have come to the boil, reduce heat down to low and add polenta in a steady stream, stirring continually. Cook polenta for 6 minutes, stirring regularly. As the polenta thickens add butter and parmesan (reserving some for garnish) to finish. While polenta is cooking, blanche beans and asparagus in boiling water for 3 minutes (or to desired degree of doneness). Drain well and drizzle with a little oil, season with salt and pepper. Divide polenta, blanched greens, balsamic mushrooms and tomatoes between plates. Garnish with remaining thyme. Enjoy!